They also have a different firmwares. The HC-05 can be a master or slave. The HC-06 is a slave only. This means the HC-05 can initiate a connection to another device and the HC-06 can only accept a connection from another device. The boards are based on the EGBT-045MS/EGBT-046S Bluetooth modules which are loaded with SPP firmware for UART communication. As far as I can tell the EGBT-045MS and EGBT-046S modules have the same hardware and the only difference is the firmware. The different firmware does change the pin outs though. 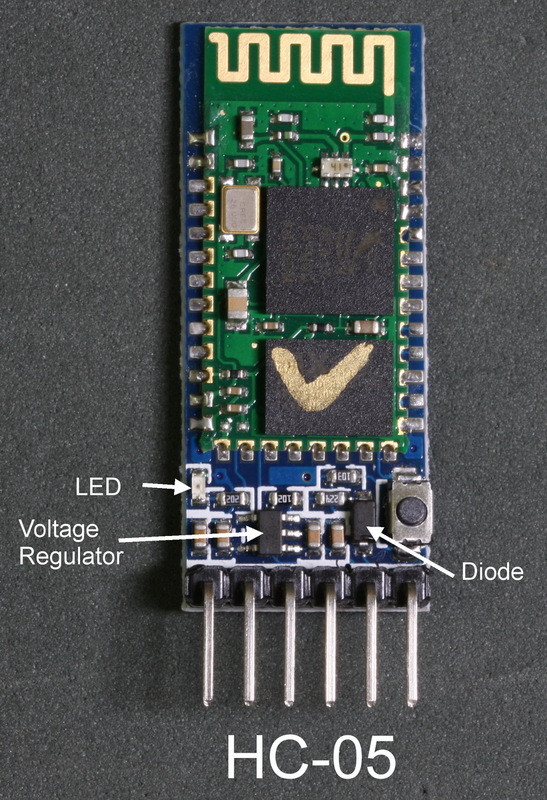 The zs-040 breakout boards include a 3.3v voltage regulator and this allows the boards to accept a VCC of 3.6c to 6v on the main VCC pin/connector. However, the RX and TX pins are still 3.3v. 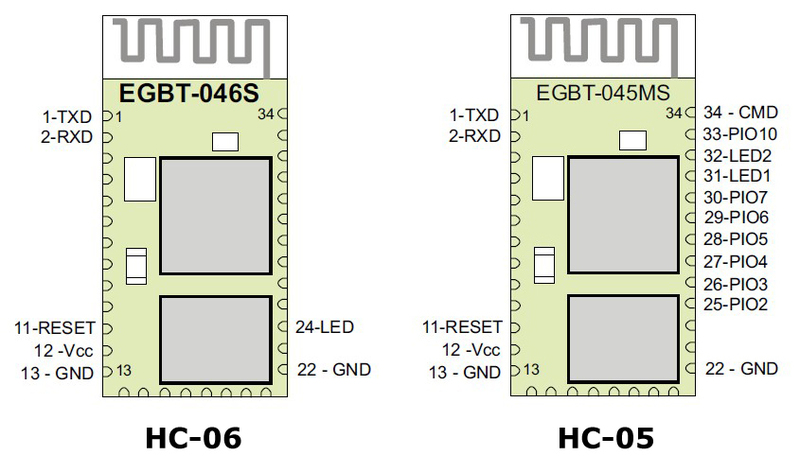 The Arduino will accept 3.3v as a HIGH signal so the HC-05/06 TX pin (out) can be directly connected to a 5V Arduino. The HC-05/06 RX pin (in) cannot accept 5V though and should not be connected directly to an Arduino. A direct connection will work short term but it damages the small blue tooth module and eventually you will kill the RX pin. The 5V rom the Arduino has to be reduced in some way and a simple way to do this is by using a voltage divider made from 2 resistors. I generally use a 1K ohm resistor and a 2k ohm resistor. The below image shows the main traces/connections on the zs-040 breakout board and as you can see, to accomodate the different firmwares certain pins have been connected together. The HC-06 does not have the EN pin or the STATE pin. The push button switch connects VCC (3.3v) to pin 34 and is used to put the EGBT-045MS / HC-05 in to AT mode. There are 2 AT modes, I refer to them as “mini mode” and “full mode”. Briefly pressing the button switch puts the modules in to mini mode and not all commands work. Keeping the switch closed puts the modules in to full AT mode where all AT commands work. Releasing the switch returns pin 34 LOW. Most HC-06 modules do not have the button switch (the space is empty) and bringing pin 34 HIGH on the HC-06 does not do anything. From the above photo you can see that the STATE pin is connected to pin 32 and to pin 25 of the small blue tooth modules. Pin 32 is LED2 on the EGBT-045MS/HC-05. Pin 32 is LOW when the module is not connected and HIGH when the module is connected. This gives us an easy way to determine if the HC-05 is actually connected or not. Connect the STATE pin to an Arduino digital pin and if digitalRead() returns HIGH you know the module has an active connection. You can, of course, connect an LED to the STATE pin as a visual indicator of a connection. I haven’t tried this on a HC-06 yet but since this is not mentioned in the manual I believe it is not active. Pulling the EN pin on the HC-05 LOW disables the module. 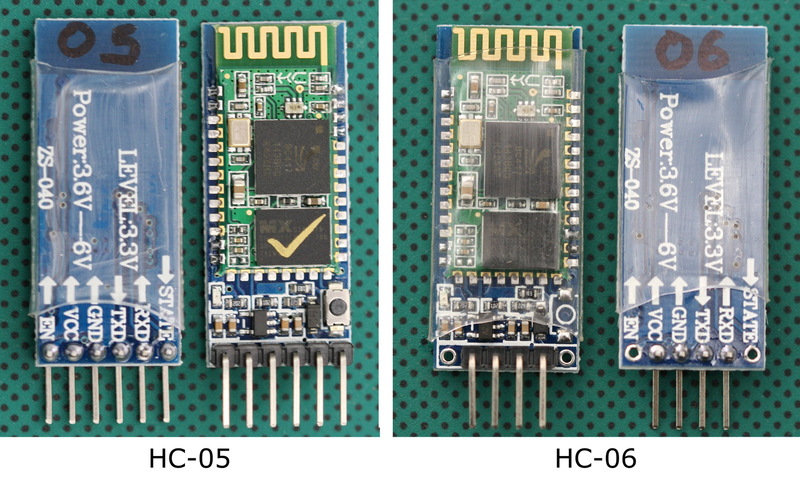 I have new HC-06 zs-040 modules that have the hc01.comV2.0 firmware. See here. be used, the ON/OFF input should be tied to VIN to keep the regulator output on at all times. But another thing is we use the arduino board not nano board like yours, is this the reason that we can’t work it out? Thanks for posting this, excellent information. Cordial saludo, he buscado mucho un dato y lo he encontrado aquí, el pin EN no sabia que hacia y solo pude deducir que tenia algo que ver con el regulador por que lo seguí en la tarjeta, buen apunte, gracias. Good explanation of the differences. Thank you.